Every cell has a membrane. The membrane is often described in simple terms as being like the ‘skin’ of a cell. Without the membrane, the cell would die, in a similar way that if a person lost their skin, they would die. However, this does not tell us much about what the membrane is or how it is constructed. We know from the structure of lipids that they are amphiphilic. This means that part of the lipid likes greasy substances and part of it likes water. This bi-polar structure is at the heart of the behaviour of lipids and can be observed when they are exposed to water. When lipids are put into water, the lipid molecules re-arrange so that the water-liking section faces the water, and the greasy-section is shielded from the water (known as self-assembly). This is behaviour is driven by the hydrophobic effect. The hydrophobic effect is an important one in the construction of biological membranes. The presence of water means that the lipids assemble themselves into a bi-layer. 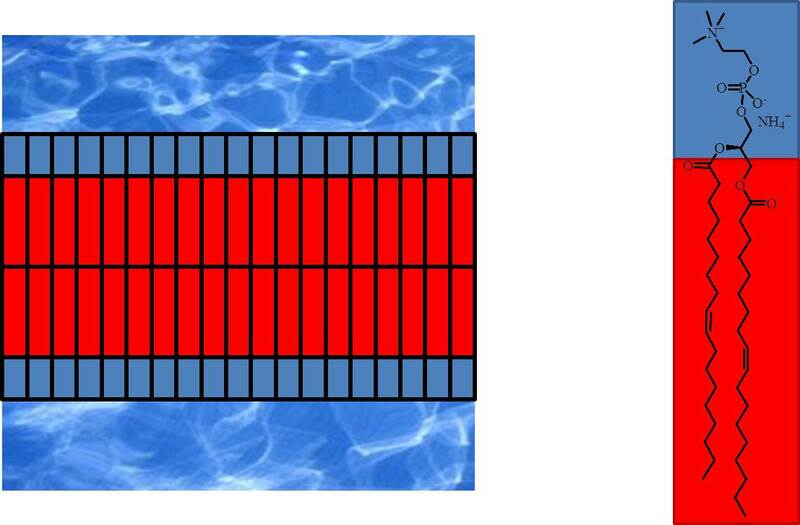 This bi-layer* contains two ‘sheets’ of lipids (called mono-layers) in which the head groups (water-liking sections) face towards the water, and the greasy sections (tail regions) face away from the water and towards one another, Figure 1. This satisfies the hydrophobic effect because the greasy sections are shielded from the water, where the water-liking sections are allowed to interact with it. Biophysicists describe this in terms of energy: it is energetically favourable for the water-liking parts of the molecule to interact with the water, and energetically favourable for the greasy parts not to interact. Figure 1. Left: The assembly of lipids when exposed to water (marbled blue region). The plain blue areas are the water-liking regions of the lipid molecules (head groups), with the red sections showing the greasy sections (tail groups). Right: These regions are shown in an example lipid, phosphatidylcholine. Figure 2) and was proposed in the journal Science in 1972 . This model is based on the idea that the membrane is flexible and molecules can move sideways in the mono-layers, allowing different parts of the membrane to do different things. Figure 2. Fluid Mosaic Model proposed by Singer and Nicholson. Diagram from Alberts et al. . However, recent evidence suggests that the Fluid Mosaic Model is a bit simplistic. Certain important processes in a cell’s life cycle are not well explained by it. This includes cell division, in which the membrane must also be divided. There is also evidence that the cell’s internal signalling processes use the membrane. Another aspect that must be taken account of is that the membrane does not exist independently of the rest of the cell. It does not just sit there. The membrane is shaped by something called the cyto-skeleton. This is a network of tubes made of protein that appears in all types of cell, and like our own skeletons is far from inert and unchanging. So, the poor old Fluid Mosaic Model has been superseded. Even it was not fluid enough to keep up with newer understanding. Although the more recent research has allowed us to see how crucial the membrane is in the running of the cell, it left biologists with a problem. How do we advance our knowledge of the membrane? Several approaches have been taken. One of these is to look at the physical behaviour of membrane constituents to find out what their contribution to the system is. This data is then used to build up a picture of the relationships between the different molecular components. This approach is called reductionism and is related to the method used by Leland Hartwell, Tim Hunt and Paul Nurse and others in discovering the role of certain proteins in the control of the cell cycle. It has been used to inform our understanding of the physical role of structural proteins (e.g., the BAR domain ) as well as lipids such as phosphatidylinositol , and cholesterol . The evidence that a reductionist’s approach has started to bear fruit is that ‘synthetic cells’  have been made. The fact that it is possible to prepare such entities, albeit basic ones compared with many if not all cells in nature, suggests that the accumulating understanding of the components of cells is broadly representative of the systems found in nature. *this word is frequently unhyphenated. S. J. 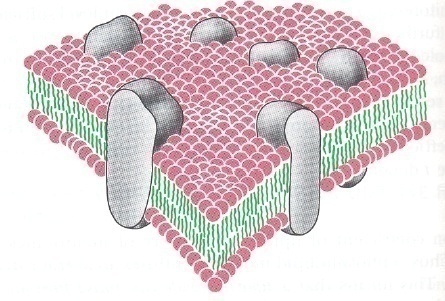 Singer, G. L. Nicholson, The Fluid Mosaic Model of the Structure of Cell Membranes, Science, 1972, 175, 720-731. http://www.sciencemag.org/content/175/4023/720.abstract?sid=5f637971-587b-43b6-b304-14a62e7f9114. B. Alberts, D. Bray, J. Lewis, M. Raff, K. Roberts, J. D. Watson. Molecular Biology of the Cell; 3rd ed., Freeman, 1994. W. M. Henne, H. M. Kent, M. G. J. Ford, B. G. Hegde, O. Daumke, P. J. G. Butler, R. Mittal, R. Langen, P. R. Evans, H. T. McMahon, Structure, 2007, 15, 839-852. See also Pykäläinen et al. Nature Structural & Molecular Biology, 2011, 18, 902–907, and Dawson et al., Trends in Cell Biology, 2006, 16, 493-498. X. Mulet, R. H. Templer, R. Woscholski and O. Ces, Langmuir, 2008, 24, 8443–8447. http://pubs.acs.org/doi/full/10.1021/la801114n. D. A. Brown, E. London, The Journal of Biological Chemistry, 2000, 275, 17221-17224. http://www.jbc.org/content/275/23/17221.full. T. F. Zhu, J. W. Szostak, Journal of the American Chemical Society, 2009, 131, 5705-5713. http://pubs.acs.org/doi/full/10.1021/ja900919c.